We have gathered here today to participate in the international Al-Quds day rally here, to remember Palestine and Al-Quds, Jerusalem. We as Jews have come to join this rally, not only here in Los Angeles. We have groups participating in these rallies today in many major cities, like New York City, Dallas TX, Seattle WA, Atlanta GA, Toronto CA, London England and Berlin Germany. Our duty today is to share with you a message of true Judaism of behalf of Anti-Zionist Orthodox Jews worldwide, a message of total solidarity with the suffering people of Palestine. We sympathize with them, we feel their pain and we strongly condemn what was done to them. 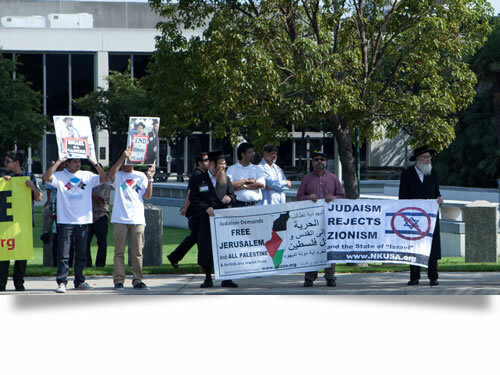 Judaism forbids, in any manner, shape or form, the occupation in Palestine. It is illegal according to the Torah, it is a crime against Judaism and it is a rebellion against the Almighty. Judaism forbids stealing, killing, harming anyone, or damaging property of another. Therefore, all the crimes committed against the Palestinian people have no legitimacy within the Jewish religion. But not just because the State of Israel is oppressing others is it forbidden according to Judaism. Even without all the above, the very philosophy of Zionism, the idea of a sovereign Jewish homeland, is in contradiction to Jewish teachings. According to Jewish belief, Jews were placed in exile about 2000 years ago when the Second Temple was destroyed. This was a Divine decree, not just due to the physical weakness of the Jewish people. We are forbidden to end this exile by physical means and are forbidden to create a state of our own. This was accepted and respected for generations and upheld by the entire world Jewry. The Jewish hope is for the Final Redemption, a spiritual event that will come about by the hand of the Almighty himself, without any human intervention, a time when all humanity will live in peace and serve the Almighty together. Judaism is a religion. It is about subservience to the Almighty. It is the covenant we made with the Almighty, to accept His laws and practice His commandments. Judaism is a religion, not nationalism, nothing to do with political inspirations or interests. We have practiced our religion for thousands of years without a country and without military power. It is only over the past 100 years that this relatively new movement of Zionism has come about, with the goal of transforming Judaism from a religion into nationalism, void of any spirituality. They have uprooted religious practice from masses of Jews and violated basics of our belief, including our belief in not attempting to end the exile by human power. The Zionists have created their state in the Holy Land, ignoring the indigenous inhabitants of the land, thereby committing many violations against Judaism and crimes against humanity. And yet they call themselves "the State of Israel" and "the Jewish State".Â They commit all their atrocities in our name and in the name of our religion. They have stolen our name; they have committed identity theft. How ironic that they claim to act in the name of the Jewish religion, that same religion they never follow or practice. We are embarrassed by these acts committed in our name, and humiliated that this was done in the name of our religion. We apologize for the injustice done to the Palestinian people, for the tragedy that has befallen Palestine and Quds, Jerusalem. Our hearts are rent over the catastrophe in Palestine. We feel the pain of the suffering victims and condemn the perpetrators of the crimes. Jews around the world, true to Judaism, will never accept this illegitimate State of Israel and will never justify its criminal actions. The Zionists always make an excuse to justify their State. They say that the Arabs hate the Jewish people, that they have hated us from time immemorial and that they just want to drive us into the sea. 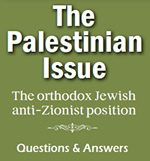 The Zionists have manufactured all forms of propaganda to make people believe that the current conflict between Jews and Arabs has always existed, that the cause of the conflict is the difference between our religions, and that therefore there is no solution to this, other than their state and its behavior to protect Jews. But we all know how despicable this falsehood is. The rabbi who stands next to me comes from Palestine. He tells stories from his parents and grandparents about the beautiful coexistence they experienced in Palestine. The Muslims never had a problem with the Jews or with Jewish religion, and Jews were always respected and protected by the non-Jewish majority in the land. We know this and we appreciate it. It was only the beginning of Zionism, in the 1920's when the Zionists first began immigrating to Palestine and intimidating its inhabitants, that gave rise to all this conflict and mistrust. The Zionist movement is to be blamed for the rivers of blood we have experienced over the past decades. I would like to take this opportunity to publicly condemn the recent Zionist behavior towards the country of Iran and its leaders. Iran was a home for Jews for thousands of years, and Iran is still today a home for tens of thousands of Jews, who are treated with the greatest respect. I personally had the privilege, with some of my colleagues, to visit Iran several times in the past few years. We saw the beauty of the land, we experienced the kindness of its people and we witnessed the freedom of religion that the Jews exercise there. We met its leaders, religious and political, and found that they don't have anything against the Jewish people or the Jewish religion; they simply have a quarrel with those who commit cruel crimes against their Palestinian brethren. I would like to clarify that all the Zionist threats and accusations do not represent the view of world Jewry, and must not be associated with our name. We all need to remember that the State of Israel is not a Jewish State, it is a Zionist State. When you criticize Israel for its crimes, don't refer to it as the "Jewish" State, but the "Zionist" State. The Zionists want to confuse the issues, they want people to call it the "Jewish" State, so that they can blame all its criticizers as anti-Semitic. We should use caution not to play into the Zionist agenda and always differentiate between Judaism, the religion and Zionism, the nationalism; between Jews, the practitioners of the Jewish religion and the Zionists, the seekers of politics and power. Finally, we pray for the speedy and peaceful dismantlement of the entire State of Israel, for the restoration of respect and dignity to the Palestinian people, for the return of all refugees to their original towns and for the return of homes to their rightful owners. At that time we can expect that the beautiful coexistence that we experienced in the past will be restored once again. Ultimately we pray that the glory of the Almighty be revealed throughout the universe, His kingdom be accepted by all and all humanity should serve Him together in peace and harmony.